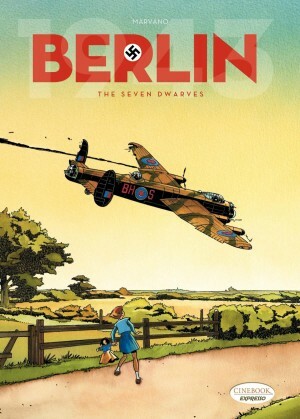 Red Baron isn’t the first time the career of legendary German flying ace Manfred von Richthofen has inspired a comic series, but in this opening album Pierre Veys limits the flying sequences to the start and finish. 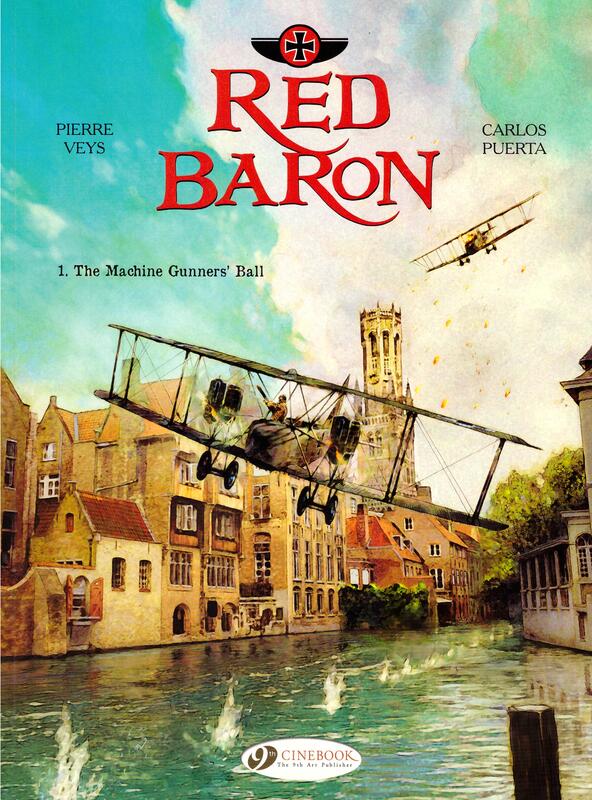 He’s producing a chronological story, filling the first half of The Machine Gunner’s Ball with von Richthofen’s background in cadet school. With the myth of von Richthofen far more prevalent than the biographical details known of his life and personality, Veys has a relative blank slate to create a character, and this von Richthofen is unpleasant. He’s a very capable, but arrogant youth with a sense of destiny. 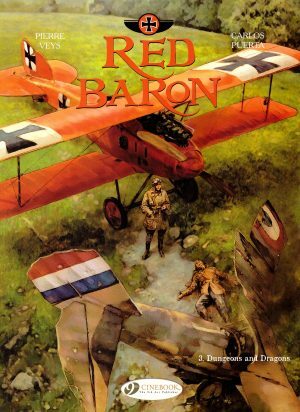 This is pre-World War I, and with combat flying still in the future, at this stage of his life von Richthofen aims to join the cavalry. Rationalising his later uncanny flying instincts, Veys establishes von Richthofen as having a form of telepathy when in danger, able to sense where attacks are coming from, and the form they’ll take, using this in an early scene to see off the school bully and his cronies. An abrupt leap forward to 1915 occurs around halfway, leading to von Richthofen, now gunner on a reconnaissance plane in occupied Belgium, experiencing his first aerial combat. No matter how good the script, a strip about any form of flying ace ultimately depends on the quality of the artist. More so than other topics, unconvincing flying sequences will kill the thrill. Spanish artist Carlos Puerta offers two distinct skills. He’s a naturally talented painter and also deals in digital manipulation, tinkering with imported photographs for panels setting scenes or requiring complex locations. The result is an eye-catching form of painted realism embedding von Richthofen in his era, and stunning aerial scenes. 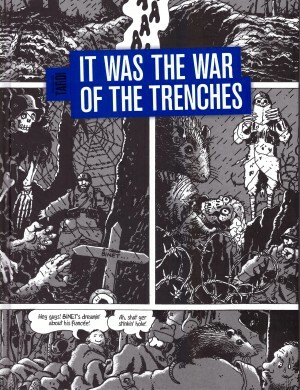 It’s all the more notable because this is Puerta’s second strip about a World War I era flying ace. 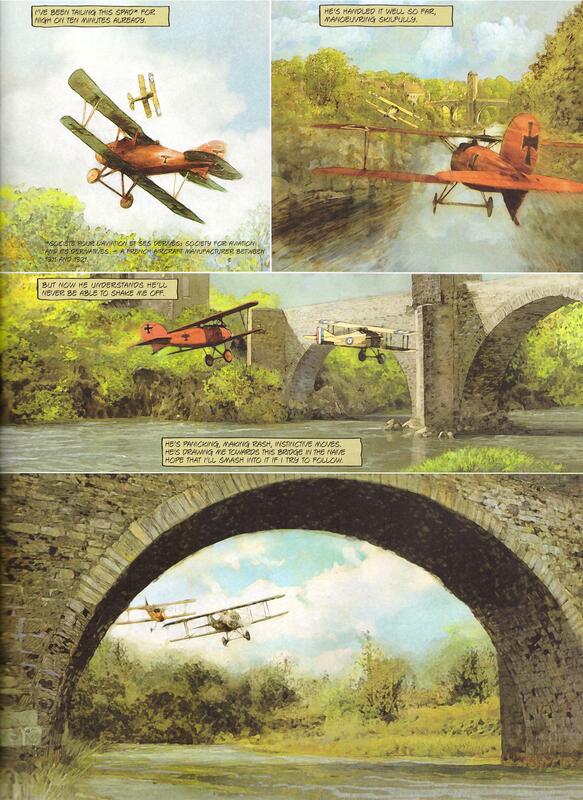 Regular Heavy Metal readers may remember what was translated as ‘No Man’s Land’, but ten years on from that Puerta takes a very different approach to both the flying scenes and the period, rendering everything in bright colour rather than a sepia wash. The art is heavily image referenced, but Puerta has a problem keeping von Richthofen consistent from panel to panel, and isn’t above re-using the same head shot in different places. One based on actor Ian Charleson appears on page 19, and again on page 22, but the von Richthofen on page 20 looks different, and the face shape on page 23 is of another man. The adult of the introductory pages resembles none of them. A strange, not quite cliffhanger ending leads directly into Rain of Blood, consistent with detached mentality that hangs over the entire story. As things stand the adult von Richthofen is no more appealing than the youth, his attitudes and Aryan appearance very much in tune with German ideals twenty years in his future. Because he’s unlikeable it removes any form of dramatic tension dependent on sympathy for the protagonist. Suspense is generated instead via the flying sequences being so well choreographed and looking stunning, but there’s one important caveat not apparent until the third and final volume. 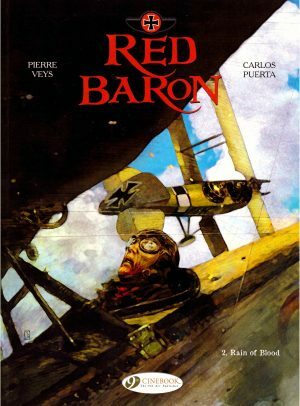 As many known biographical details are used, Red Baron appears to be a dramatised biography. It’s not.